City Farm SLO is a 19-acre parcel of class-one irrigated farmland located along Highway 101 between the Madonna Shopping Center and Los Osos Valley Road, adjacent to the 140-acre San Luis Ranch. Both properties are contained within the City’s Calle Joaquin Agricultural Preserve. The City Farm property is owned by the City of San Luis Obispo and is managed by the 501C(3) non-profit organization, Central Coast Grown, under the terms of a 20 year lease with the City. As specified by the City’s General Plan, the purpose of the Preserve is to maintain this “signature landscape” in sustainable agricultural production and to provide its citizens with educational opportunities to learn about food production and local food systems. City Farm SLO represents a unique collaboration among municipal government, a non-profit organization, business enterprises, educational institutions, and public and private funding agencies committed to the revival of community engagement in sustainable agriculture. Find your way around the whole City Farm property and the City Farm Educational Gardens/Meeting areas. 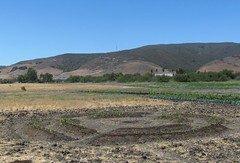 Learn more about the history of City Farm – SLO and itscommitment to upholding a “signature landscape” for the community. 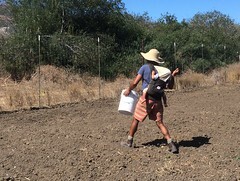 Meet the tenant farmers that form the collective of small, beginning farmers on City Farm – SLO’s 19-acre parcel. Find out what they’re growing and where you can buy it.